Italy: Rome, Florence, Umbria, Ravenna, Spilimbergo, Venice, Udine. Each year, the tour is a bit different. Fall 2019 brings us to Umbria and Ravenna for the Mosaic Biennial. Click here to receive the latest on upcoming trips. What an absolutely fabulous time my husband and I, and our friends the Gaglios, had on Julie Richey’s 2015 tour! Jam-packed with sites to see and long meals of the best food and wine, we explored and wined and dined our way through Rome, Chianti, Florence, and Ravenna. Julie’s familiarity with Italy’s treasures and language, along with her contacts cultivated throughout the years, opened up opportunities which we could not have possibly arranged for ourselves. From the visit to Centro Aletti Mosaic Studio and the Vatican Mosaic Studio in Rome, to the lovely lunch and tour of the gorgeous Antinori Winery in Chianti, to the visit at Lastrucci Pieta Dura in Florence, and finally to the Mosaic Capital of the World, Ravenna (with too many other delights to mention), Julie’s efforts and expertise, as well as those of her trusty sidekick Nancie Mills Pipgrass, were evident from beginning to end. Post-lunch (three courses with paired wines and vin santo for dessert), the group prepares to descend six stories underground to tour the Cantina Antinori winery. Margy, on her second Mosaic Masterpieces Tour, with a piece she made during an exclusive tour workshop at Kokomosaico. She used her own painting for inspiration. Your tours really offer not just the opportunity to visit many ancient and modern mosaic related sights, but to visit important studios and schools to meet European mosaic artists and promoters of mosaic art. Gaining insight into different individuals intentions, works and views on mosaic in the world today, for me, is very valuable. These collective voices have fueled my mosaic thought and work with a renewed sense of freedom to use my own mind and creative will. That kind of access and openness is so conducive to creativity and worth every effort to be a part of your tour. Participants get up close to the work of Father Rupnik at Centro Aletti in Rome. Lynne ascends the sculptural for-ten steel stairway at Antinori. "It was a magical place especially with the foggy drizzle that made me feel like I was in a dream as we looked over the luscious hills of Chianti. 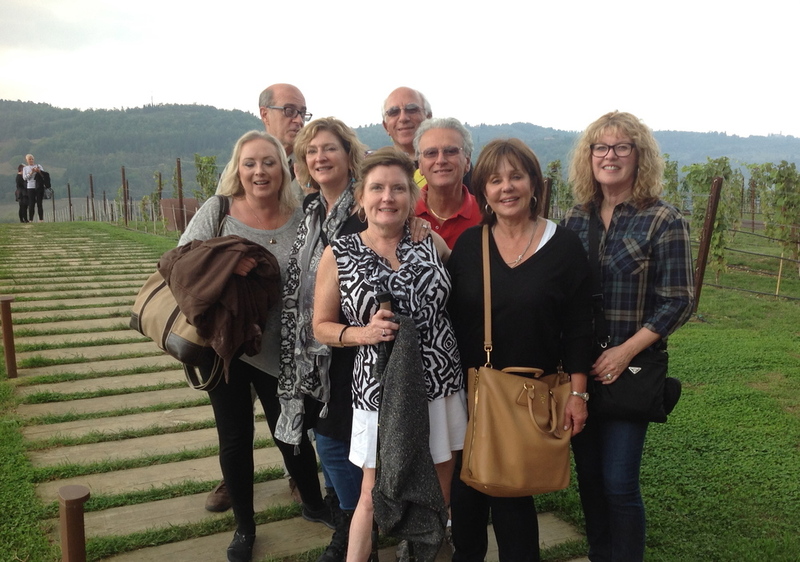 The wine pairing lunch was very special and the tour was just right." Interested in our future tours to Italy and Mexico? Sign up for our newsletter here.